Aquaponics USA has finalized a Trademark that is going to redefine pure, organically grown food. Above is this Aquaganic™ Trademark, which is being used in the marketplace by Aquaponics USA, to describe food grown using aquaponic food growing technology. The by-line, “Beyond Organic” describes a certification that is more demanding than the organic certification because “Aquaganic” products are safer, cleaner and purer than any other products on the market. The following is an explanation of why we are making this claim. Don’t get us wrong. The organic food movement is one of the best things that’s happened on our planet; and right now it’s the healthier choice we have compared to the heavily pesticide sprayed Big Agra crops that dominate the marketplace and the GMO crops that are turning food into poison. But it won’t be long before we have another choice because Aquaponic farms are springing up all over the world; and it’s those farms that will be able to produce Aquaganic™ products. 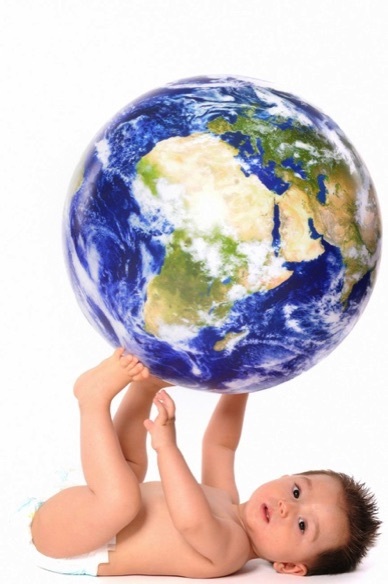 So let’s take a look at the pros and cons of each of the food growing methods being used on planet Earth today including: Pesticide sprayed crops, Organic crops, GMO crops, Hydroponic crops and Aquaganic™ crops. The following is a brief overview of each of the five ways we produce food. 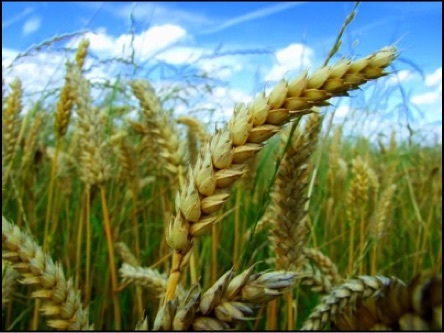 What are Pesticide sprayed crops and how did they come about? In the 1850’s more than half of the U.S. population were either farmers or lived in rural communities. Then came the Industrial Revolution, which changed the way people lived in both Europe and the U.S. Spanning a mere 100 years from 1800 to 1900, the Industrial Revolution turned primarily agrarian, rural societies into industrialized urban ones. Industrialization marked a shift to powered, special-purpose machinery, factories and mass production. It wasn’t long before the U.S. and other countries challenged themselves to make agriculture more efficient and the principles, strategies and technologies of industrialization was applied to farming. Since then three and one half million family farms in the U.S. have vanished while large corporate farms have replaced them. The goal of these Big Agra Farms--to be the supermarket for the world. With the development of new energy sources, we were able to extract and synthesize fertilizers and pesticides for the first time. This happened in the 1930’s. In 1944, an international campaign called the Green Revolution was launched in Mexico with private funding from the US. It encouraged the development of hybrid plants, chemical controls, large-scale irrigation, and heavy mechanization in farms around the world. 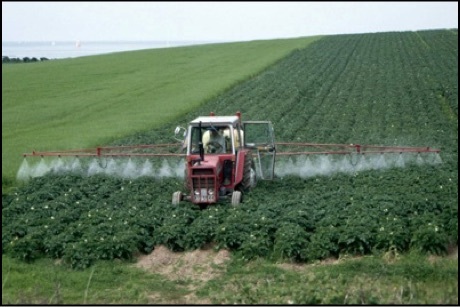 Now, just about every food crop that isn’t organic is sprayed with pesticides. Most pesticides are manufactured compounds that are designed to kill specific pests, such as weeds and insects. Many pesticides have the potential to harm non target organisms, especially if the organisms are exposed to high levels or for a long period of time. 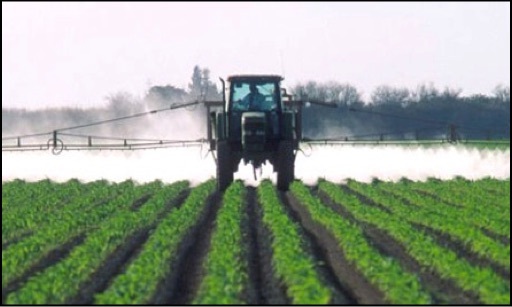 Pesticides have been in use now for over eighty years; and concerns about their affect on human health, aquatic and other animal life as well as the environment are continuously being debated. But Big Agra is determined to persevere so they continue to plant vast fields of single crop species, a practice called monoculture, which is the opposite of the way nature and the now marginalized family farmers produce crops. And they continue to use huge amounts of pesticides, which are showing up in major rivers, aquifers, ground water and in human test subjects. A staggering 93% of Americans tested by the CDC (Center for Disease Control), had metabolites of chlorphyrifos, which is a nuerotoxic insectide, in their urine. And 99% of Americans tested positive for DDT degradants, even though DDT hasn’t been used in the U.S. since 1972. How do these two pesticides get into our bodies? Through the food we eat or have eaten. Chlorpyrifos remains one of the most widely used pesticides in U.S. agriculture. DDT is a long-lasting persistent organic pollutant (POP) that bio-accumulates up the food chain, and can be found in most butter and milk. These are but two of the dozens of pesticides found on our food, even after washing. Persistent Organic Pollutants (POPs) is the name given to organic compounds that are resistant to environmental degradation. It has been observed that they persist in the environment, are capable of long-range transport, bioaccumulate in human and animal tissue and biomagnify in the food chain. In short, POPS are bad dudes that were used or are currently being used as pesticides. Others are still being used in industrial processes and in the production of a range of goods such as solvents, polyvinyl chloride and pharmaceuticals. Most POPs are manmade intentionally or are the by products of industrial processes. What constitutes Organic food and where does it come form? This brief history of organic farming is a fascinating story that crosses continents under the tutelage of two men, Albert Howard of England and J. I. Rodale of New York. Albert Howard influenced J. I Rodale and is considered by many of the English-speaking world to be the father of modern organic agriculture. However, with his 1887 diploma in Agriculture in hand, Albert started out as the agricultural adviser in charge of an English government research farm in India from 1924-1931. His original aim was to teach Indians how to institute the new industrialized farming methods; but it wasn’t long before he realized that traditional Indian farming practices were superior to what had become conventional agricultural science. One important aspect he took notice of was the connection between healthy soil and the villages' healthy populations, livestock and crops; and he’s quoted as saying: “the health of soil, plant, animal and man is one and indivisible." J. I. Rodale was a man of many talents, a playwright, editor, author and entrepreneur. Born the son of a grocer, the importance of food was in his bloodline; and not long after discovering the writings of Albert Howard, J. I. Rodale became an advocate of organic agriculture and founded the Rodale Organic Gardening Experimental Farm in 1940. It’s noteworthy to point out that as the Green Revolution swept across the world stage, there was already a counter movement burgeoning in Rodale’s Experimental Organic Farm. In 1942, he published his Organic Farming and Gardening Magazine, which later was named Organic Gardening. This magazine is the most read gardening periodical worldwide; and we here at Aquaponics USA have been subscribers since we first discovered aquaponics in 2008. To Rodale, agriculture and health were inseparable. He, like his mentor, Albert Howard, believed that healthy soil required compost and the elimination of poisonous pesticides and artificial fertilizers. He believed humans would be healthier if they ate food produced by naturally composted soil without the use of these pesticides and fertilizers. For a full reading of the document, go to FORMAL RECOMMENDATION BY THE NATIONAL ORGANIC STANDARDS BOARD (NOSB) TO THE NATOINAL ORGANIC PROGRAM (NOP). Bottom line, as of that recommendation, aquaponically grown plants and fish are not eligible to be certified organic by the USDA. Some companies have found loopholes and obtained USDA Certification; but they are few and far between. So Organic Certification Loopholes do exist. Those companies selling aquaponic vegetables are proof of that. But Loopholes can be positive or negative. The following are potential negative loopholes to the USDA Organic Certification. In April, 2012, the Livestock Committee of that same Board, the NOSB, in a worthy attempt to tighten restrictions on GMO vaccines admitted that under its present regulations (those in affect on April 3, 2012): “livestock producers use all vaccines and are not required to determine if they are using non-GMO (conventional) or GMO derived vaccines.” In other words, a person could be eating USDA Certified Organic meat that has been given a GMO vaccine. For a full reading of the document, go to National Organic Standards Board Livestock Committee National List Proposal Vaccines from Excluded Methods. Here’s another USDA Organic Certification nightmare. It’s called Neotame; and it’s the poison of choice to replace Aspartame. 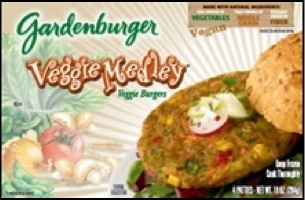 This neurotoxin has been given the green light by the USDA and isn’t even being listed on ingredient lists, requires no labeling and has been declared safe for USDA Certified Organic products! What?! Neotame has a similar structure to aspartame except that it appears to be even more toxic than it’s found out and exposed relative. But that’s not all. A product called “Sweetos,” which is actually composed of Neotame, is being substituted for molasses in animal feed. Then there’s the list of non organic products that are allowed ingredients in organic products. According to Michael J. Potter (what an apt name when you consider he’s fighting some of the biggest food giants on the planet--the Big Food companies that actually own most of the nation’s organic food industry), the NOSB Board is stacked with people representing companies like Kellog, PepsiCo, Heinz, Coca-Cola, Cargill, ConAgra, General Mills and Kraft. Big Food has become Big Organic; and as far as Mr. Potter is concerned the USDA Organic label is a complete sham because Big Food has co-opted and completely corrupted the organic food business. He’s the owner of Eden Foods, which is a major organic foods producer and wholesaler; and he refuses to put the USDA Certified Organic label on his products. When he showed up at the NOSB Board Meeting in late May, 2012 regarding that list of non organic products that are allowed ingredients in organic products, he was given three minutes to voice his concerns. He focused on two such ingredients, synthetic inositol, which is manufactured using chemical processes and carrageenan, a seaweed-derived thickener with a somewhat controversial health record. Two days later, the NOSB Board voted to keep carrageenan on the ever growing list of nonorganic ingredients that can be used in products with the coveted USDA Certified Organic label. 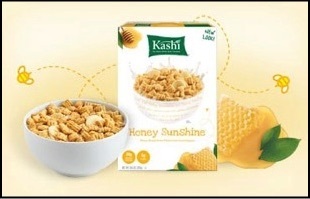 Because the giant corporations don’t advertise how much they have encroached into the organic market, most people have no idea that major organic brands such as Bear Naked, Wholesome & Hearty, Kashi, Naked Juice, Walnut Acres, Health Valley and Spectrum Organics all belong to the Big Food companies listed above. Between the time the Agriculture Department came up with its proposed regulations for organic food in 1997 and the time those rules were made law in 2002, hundreds of small, independent organic companies were purchased by the corporate giants. 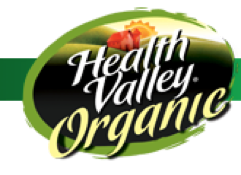 Heinz and it’s affiliate, Hain, bought 19 organic brands alone. Now Big Food has assumed a powerful role in setting the standards for organic foods; and these major corporations are dominating the board that sets these standards. If they want to use carrageenan, they’ll use carrageenan. As these Big Food companies started stacking the Board, the list of nonorganic materials approved for organic foods increased. It’s called the National List and it has grown from 77 items in 2002 to 250 nonorganic substances in 2012. The 15 member NOSB Board requires a 2/3 majority to add an nonorganic ingredient to the National List. Ammonium nonanoate, a herbicide came frightenly close to getting on the list in December of 2012. The six votes that almost pulled off this cue came from General Mills, Campbell’s Soup, Organic Valley, Whole Foods Market and Earthbound Farms, which had two votes at the time. Remember those corporate names because they are not friends of organics. Had it prevailed, it would have been the first time a herbicide was put on the list. Mark Kastel, director of an advocacy group called Cornucopia Institute agrees with Mr. Potter and says the system has “been neutered”. His Cornucopia Institute wrote a scathing White Paper on the subject of Corporate Influence at the USDA’s National Organic Program after a battle in December of 2011 over the addition of docosahexaenoic acid algae oil (DHA) and arachidonic acid single cell oil (ARA) to the National List. Do we really think that the founders of organic food, Albert Howard and J. I. Rodale had these kinds of ingredients in mind when they coined the name “organic”? According to Mr. Potter, his label by Board Members as being a “liberal, immature, radical” ought to be pointed in the Boards’ direction because he’s not the one debating whether or not “organics should use genetically modified additives or nanotechnology, which is what I’d call radical.” It’s clear that Board seats are going to corporate dominated companies and not to independent organic farmers or even bonafide consumers as some of the seats are designated to do. Katrina Heinz, a General Mills executive was actually appointed to serve as a consumer representative on the board in December 2005 by Mike Johanns, the agriculture secretary at the time. And Ms. Beck, the national organic program manager at Driscoll’s, to a seat that is, by law, supposed to be occupied by a farmer. How more blatant can seat stacking be? If these aren’t reasons enough to question what you’re really getting when you buy USDA Certified Organic products, I don’t know what would. Sadly it seems the whole industry, just like the FDA, has been co-opted by the Big Food Corporations. We have to report here, that when we started writing this section of this page, we had no idea we were going to find this kind of corporate corruption in the U.S. organic food industry. Hopefully, the organic food industry in other parts of the world has faired better. Here’s one consolation. In spite of the 250 ingredient strong National List, we still believe that USDA Certified Organic Food is healthier and safer than the Big Agra pesticide and chemically altered crops. One way to make sure your food isn’t packed with ingredients from the so called approved National List, ingredients you can’t spell and can’t pronounce is to stay away from packaged and processed foods all together. An organic tomato, at least for now in 2013, is pretty much guaranteed to be just that, a tomato with no additives. So please forgive us for being the bearers of this bad news about the USDA Certified Organic label. It looks like that label is heading the way of labels a serious organic eater might want to avoid at least when it comes to packaged and processed foods. We’ll be looking for the Eden Foods Label when it comes to those kinds of foods. We want to leave you with this thought. 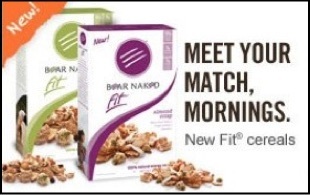 It’s better to be forewarned and forearmed than to be fooled by what is becoming another Big Food sham. 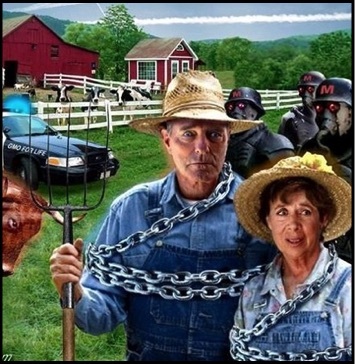 Go here to read a paper by the Cornucopia Institute entitled “The Organic Watergate--White Paper Connecting the Dots: Corporate Influence at the USDA’s National Organic Program”. Go here to read the full article, "Has Organic Been Oversized?" from the New York Times about the corporate take over of the NOSB Board. Go here to link to the RODALE INSTITUTE. Go here for a full reading of the ELECTRONIC CODE OF FEDERAL REGULATIONS regarding TITLE 7-Agriculture/PART 205--NATIONAL ORGANIC PROGRAM. 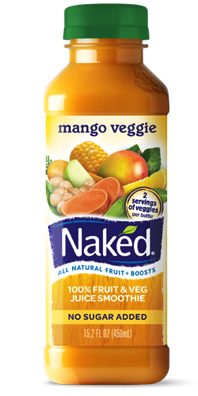 Go here to see many of the 250 approved nonorganic ingredients on the National List. Go here to read about the dangers of Neotame, the sweetner that like Aspertame is a neurotoxin. What are GMO’s and where do they come from? The GMO story is a long convoluted one; and we can’t even begin to pretend to cover it all here; but we can give you an overview. GMO stands for genetically modified organisms; and if that isn’t enough to cause you pause, maybe the following will. But all that mattered to the GMO advocates were potentially huge profits. “One project was to map the rice genome. It launched a 17 year effort to spread GMO rice around the world with Rockefeller Foundation money behind it. It spent millions funding 46 worldwide science labs. It also financed the training of hundreds of graduate students and developed an ‘elite fraternity’ of top scientific researchers at Foundation-backed research institutes. It was a diabolical scheme aiming big – to control the staple food for 2.4 billion people and in the process destroy the biological diversity of over 140,000 developed varieties that can withstand droughts, pests and grow in every imaginable climate.” In other words, the goal of this GMO rice project was to replace all the natural rice that had been developed over hundreds if not thousands of years with GMO rice. By this time several of the world’s major chemical companies known unaffectionately as Big Chemi had gotten wind of the huge monetary windfall possible through GMOs. Monsanto was one of those companies, along with DuPont and Cargill. Below are a series of memorable illustrations by the controversial artist, Dees. Monsanto was established in 1901 and it’s first product was saccharin. By 1955, Monsanto branched out into the petroleum business and acquired Lion Oil. With this acquisition, it was introduced to the fertilizer business. From there it moved into the agricultural chemical business with one of its leading products, a weed killer called Round Up, which is known worldwide. Current Roundup Ready crops include soy, corn, canola, alfalfa, cotton, and sorghum, with wheat under development. Roundup Ready crop seeds have become known as "terminator seeds." This is because the crops now produced from Roundup Ready seeds are sterile. Each year, farmers must purchase the most recent strain of seed from Monsanto. This means that farmers cannot reuse their best seed. These franken seeds have been patented by Monsanto; and any cross pollination onto farmer’s fields who have not purchased Monsanto seeds gets met with high paid Monsanto lawyers filing lawsuits aimed to destroy the hapless farmer who declined to get with the program. Just to make sure you get the whole picture. When GMOs hit the U.S. market, the FDA, under the influence of Monsanto lobbyists, declared them safe and not materially different from non-genetically modified versions of the same crops. There was no outside testing or scientific research required past what Monsanto and the other GMO pushers claim in their in house so called scientific research. These products were unleashed into the U.S. and world market place with no required labeling either. So we don’t really know when we’re eating genetically modified products. Given the sad fact that 88 percent of corn and 94 percent of soybeans grown in America are genetically modified and many processed and packaged foods have these ingredients in them, you can bet you’re eating GMOs by the mouth full. Now Monsanto is actually claiming that their GMO seeds are organic because they only splice organic seeds. How long will it take for the NOSB Board to be hijacked by this corporate giant and declare along with Monsanto that GMOs are organic. That will be the death knoll for the USA Certified Organic Label. Recently, Monsanto was purchased by Bayer so now Bayer is the evilest Corporation on the planet. You might want to buy Generic Aspirin. 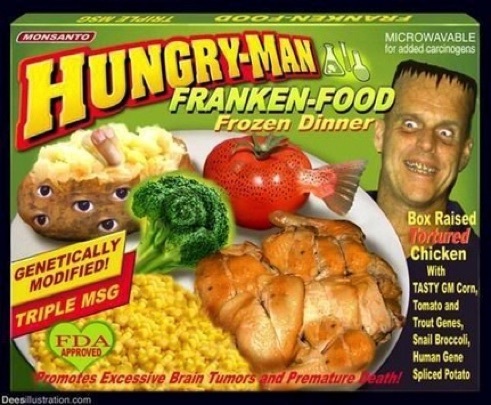 And apparently, Dr. OZ, the famous televised, supposedly alternative health doctor, Dr. Mehmet Oz, has also drunk the GMO cool aide as he has recently declared that GMO foods are actually the same as organic. 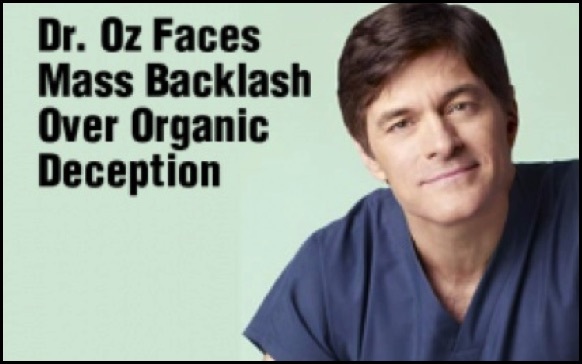 In a 2012 article in Time Magazine, Dr. Oz actually states that those who buy organic are ‘snooty’, ‘elitists’. He then goes on to say that GMO foods are the food of the ‘people’--people who want to become obese, get cancer and become infertile. And a new disease, along with the rise of obesity and other known diseases caused by GMOs, is coming on line. It’s called Morgellons Disease; and it’s characterized by itchy welts that spread over the body depending on the severity of the outbreak. Sometimes these welts exhibit very strange protrusions of unidentified fibers with no biological origins. 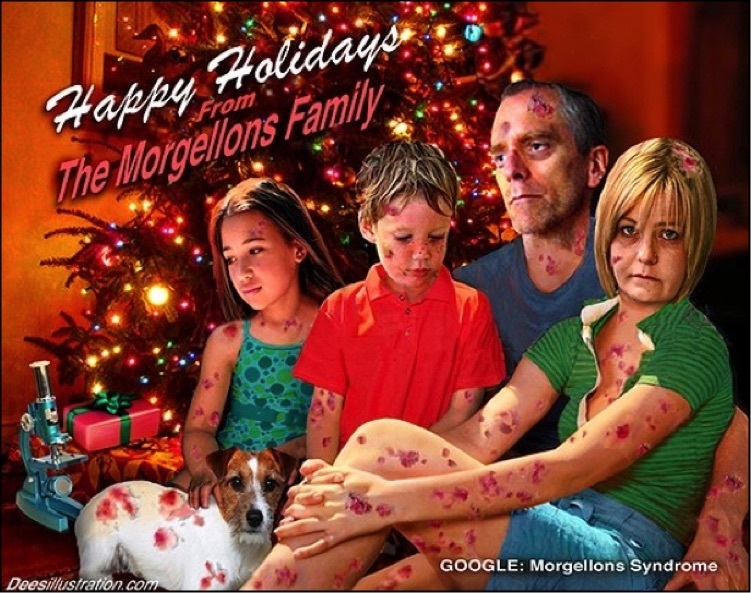 Victims of Morgellons are discovering that eliminating food they suspect of having GMOs, causes the welts to disappear. 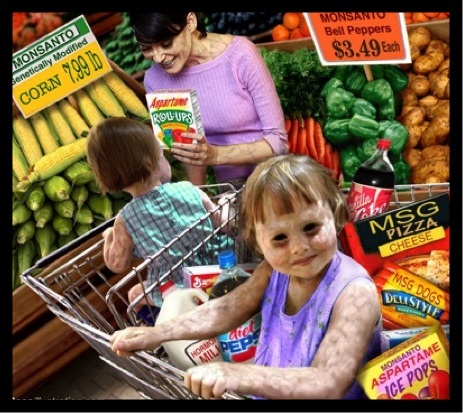 Need we say more about the horrors of GMOs? We haven’t even mentioned the rise of the “Supper Weeds” and “Super Bugs” that are learning to resist Round Up. There’s an article you can read about that below. GMOs are a scourge perpetrated on the people of the world by greedy mega corporations that have no concern for the safety of the people eating their products or the safety of the natural ecosystem of our planet. Say, “NO” to GMOs. Go here to learn about the appointment of ex-Monsanto Executive to serve as the U.S. Food Safety Czar. Go here to read the article entitled "Activists Call for Food Safety Czar's Ouster". Go here to read the full article by Steven Lendman, Food is Power , a review of William Engdahl’s book entitled Seeds of Destruction. Go here to read the article entitled "Who and What is the Monsanto Chemical Corporation?" Go here to read the article entitled "Agent Orange: Background on Monsanto's Involvement" right from the horse’s mouth. 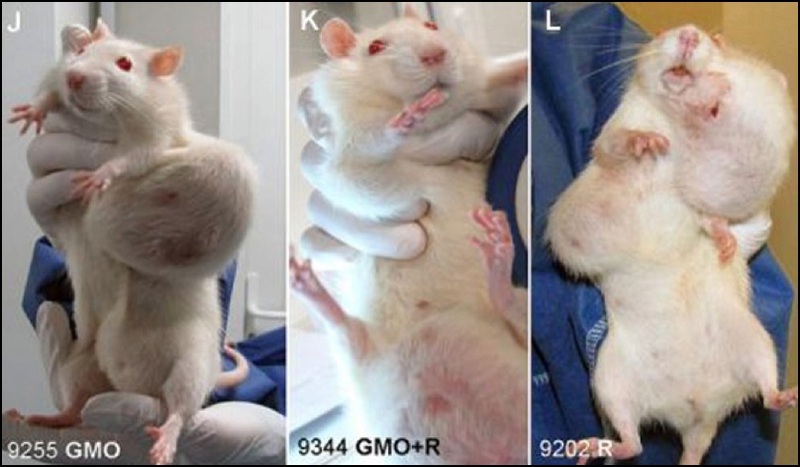 Go here to read the article entitled "Minor Pests, Major Problem: GMO Crops, Superweeds And Pest Control"
Go here to read about the French Study that exposed the cancer connection to GMOs. In a recirculating system the nutrient solution is pumped from a reservoir to the plant’s roots. The excess nutrient is then allowed to drain back to the same reservoir (Fig 1.1). This permits reuse of the nutrient solution until it is either depleted of useful elements or is contaminated. The nutrient solution is then discarded and replaced with fresh nutrient. Here is a basic Non-Circulating Hydroponic Method. The system (Fig. 1) comprises the following: a) a watertight container (e.g. a polystyrene box) to hold the nutrient solution; b) a framework or support structure (e.g. a polystyrene lid) covering the container, and c) a support medium for the seed or seedling. The medium (e.g. smoked rice hulls) may form a complete layer in the framework structure (for root or tuber crops) or be placed in separate receptacles (e.g. plastic perforated cups) suspended from the support structure. Simple netting or the right size of holes in the receptacles ensure that the medium does not enter the nutrient solution. 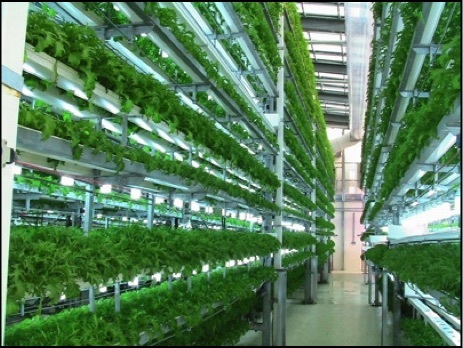 As you can see from the pictures above, especially the one on the right, Hydroponic food growing operations can take on a very high tech and costly configuration. However, if the Hydroponic grower has established a demand chain and is supplying major super markets and/or health food stores, this kind of mechanization can be very profitable in the long run. What you don’t see in these Hydroponic growing environments are tractors, plows or massive amounts of sprayed pesticides as Hydroponic plants require little, if any, fertilizers or pesticide-like chemicals; and soil is not depleted in a Hydroponic environment, because there is none. As long as the necessary chemicals are readily available, Hydroponically grown vegetables are a viable alternative to soil-based agriculture. They are healthier for the consumer because fewer pesticides are used to grow them. There is no need to use GMO Round Up resistant seeds because weeds are non existent and pests are at a minimum. There are also ways to make Hydroponic agriculture completely organic even though the NOSB (National Organic Standards Board) has declared that only soil-based crops can be USDA Certified organic. One of the main challenges to setting up a Hydroponics system of any appreciable size is the initial cost compared to soil-based farming (unless you have to buy the farm). This can be prohibitive on a large scale; but need not be on a small one. What constitutes Aquaganic™ food and where does it come from? 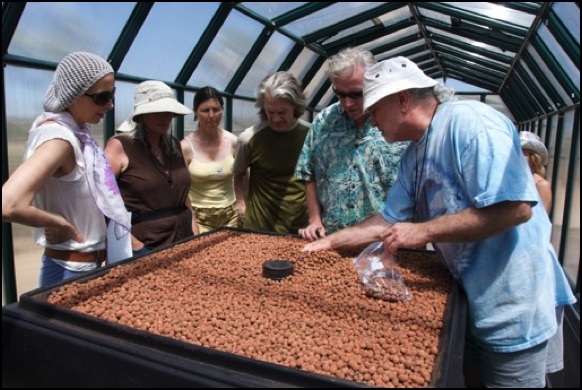 Aquaganic™ foods are grown exclusively in aquaponics growing systems. Aquaponics like Hydroponics has been around for centuries; but the emergence of Aquaponics food growing technology is making a big splash on the world stage in the new millenium. When Aquaponics USA, stepped into the internet in 2009, a Google search of the word “aquaponics” resulted in about 2,000 results. Today, a Google search of the word, “aquaponics” results in almost 11,3000,000 results. That’s some really fast growth in 10 years. So what is Aquaponics? It’s a food growing technology in which the waste from live fish is used as the nutrient source for growing vegetables and fruits. An aquaponics system cross-links the fish tank with the vegetable grow beds and a natural biological process called nitrification breaks down the fish waste so it can fertilize the plants with the nutrient rich water. In many ways, Aquaponics is like Hydroponics except the fish take the place of the nutrients that have to be added to a Hydroponic system. And the fish become the second crop in this multi-cropping food growing system. Unlike Hydroponics systems that can be recirculating or non-recirculating systems, Aquaponics systems are always recirculating their water and none of the nutrient rich water ever leaves the system or wears out or needs to be discarded or replaced (with few exceptions). One exception to this continuous recirculation of the same nutrient rich water condition occurs if the Aquaponics system water becomes unstable due to high ammonia, nitrate or pH levels and the last resort is what is called a water exchange, which is the elimination of much of the system water and the replacement of that water with fresh water. Water exchanges occur infrequently in Aquaponics food growing systems. Aquaponics food growing technology is riding high on the shoulders of Hydroponics in that it has borrowed much of the advances that Hydroponics has made since it’s major introduction into agriculture by the UC Berkeley team. 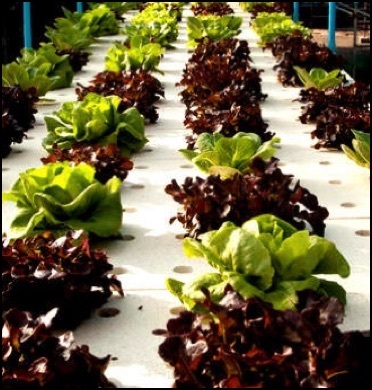 Aquaponics uses NFT, Flood and Drain and Aeroponics methods of growing just like Hydroponics. It also uses a method of water delivery which is called Continuous Flow where the water is exchanged but stays in the media Grow Beds continuously. Aquaponics systems that use Grow Beds divide along the lines of types of Grow Beds. 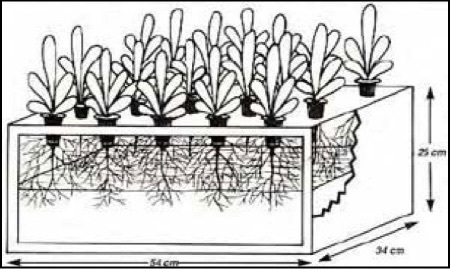 There are media Grow Beds and Deep Water Culture Grow Beds that are often referred to as Raft Systems in which the Grow Beds take the shape of long troughs. The above pictures demonstrate these two basic types of Grow Beds. The Media Beds use many of the same types of media used in Hydroponics Systems including expanded clay, gravel and perlite. In these Grow Beds, the media also acts like a biofilter and houses the naturally occurring friendly bacteria that break down the fish waste through the process of nitrificaiton in which ammonia and nitrites are converted into nitrates, which the plants use as fertilizer. In the DWC Raft Systems, floating sheets of polystyrene with holes cut in them hold the plants, which are sitting in net pots that are suspended in the water. 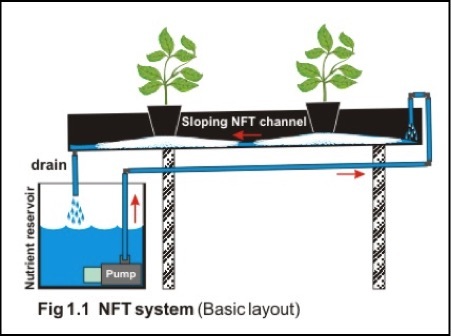 In these systems, a separate biofiltering device is needed to convert the fish waste into a usable nutrient rich nitrate solution for the plants. These two very different Aquaponic growing technologies grow different kinds of plants. The flood and drain media beds are best suited for growing larger flowering plants like tomatoes as those plants require a period of time (usually a 15 minute cycle) in which their roots are free of water and taking in lots of oxygen. The flowering plants are usually larger plants with large leaves and also need the media to hold them in place in their beds. However, leafy greens, such as lettuce, will grow profusely in a continuous water environment and don’t need exposure to oxygen outside of the water in the trough or the kind of support the flowering plants need. So leafy greens are placed in DWC Raft systems and flowering plants are placed in Flood and Drain Media Grow Beds. Our Aquaponics USA Food Forever™ Farms will utilize both of these types of Grow Beds to grow copious amounts of fruits and vegetables in our Modules. The history of Aquaponics goes way back in time; but it’s modern version of Fish Tanks and Grow Beds is fairly young. For the past twenty years or so Aquaponics has been hiding out in University Research Labs and has only emerged into the mainstream in the last five years or so. No discussion of the history of Aquaponics is complete without mentioning the Agricultural Experiment Station at the University of the Virgin Islands (UVI), St. Croix, under the direction of Dr. James Rakocy. Mr. Rakocy has earned world-wide recognition for over 25 years of work in refining Aquaponic systems and deserves credit for developing the first commercially viable Raft Aquaponics System and training countless individuals in the field of Aquaponics. 2.Aquaponics grows food in areas where the growing season is short. 3.Aquaponics grows food using 90% less water than traditional agriculture. 4.Aquaponics grows food without needing large swaths of land or soil. 5.Aquaponics grows two crops, fish and vegetables, using the same water. 6.Aquaponics grows food faster and denser than traditional agriculture. 7.Aquaponics grows food within local communities thusly reducing the need to import or transport it. •no fertilizer, pesticides, antibiotics, food additives, etc. Because fish are the drivers of an Aquaponics system, Aquaponics farmers can’t help but be purists when it comes to synthetic chemical inputs like fertilizers and pesticides. So for Aquaganic™ certification, there is no “National List” of approved items. The fish cannot handle even a drop of these toxic ingredients. They can’t even handle metal in their systems (except for stainless steel) because of metal toxicity. As we develop this Certification process further, get our Certification Board in place and complete our Aquaganic Certification website, which is parked at www.certifiedaquaganic.com we will undoubtedly adjust these or add more requirements for Aquaponics Food Growing companies to become certified with the Aquaganic™ Certification Label. 1. Fish meal is not only used in fish feed. It’s also being used in swine, poultry and even pet food. No one has been arguing that we stop eating pork or chicken or that we stop feeding our pets to save fish. Nevertheless, we know we have to start taking drastic measures to save the ocean’s fish. Because the aquaculture industry has been receiving so much negative criticism due to its more obvious use of fish meal in their food products, that industry is running extensive research to find an alternative to fish meal for fish food. Right now there are fish food products on the market that do not use fish meal; and at Aquaponics USA, we are selling one of those organic fish food products on our Fish Food page. It won’t be long before the research pays off; and we’ll have several choices of high quality fish food that use reduced amounts of fish meal or none at all available thanks to the aquaculture industry. 2. One fourth of the fish used for fish meal comes from the inedible trimmings off of fish that has been processed for eating. In other words, one quarter of the fish used for fish meal comes from fish that have been harvested from the sea for the purpose of human consumption. 3. Fish oil, which is also added to the fish food, is a by-product of fish meal production and fish processing. Before aquaculture came on the scene, fish oil was already being used for technical purposes as fuel, an additive to paint and to harden margarines. Isn’t it an improved use of fish oil to be using it to feed food fish? 4. Between the years 1995 and 2009, we almost halved our use of wild fish material to produce fish feed for salmon. INTERESTED IN GETTING THE AQUAGANIC™ CERTIFICATION? This Certification is designed to be a Certification WITHIN THE AQUAPONICS INDUSTRY. There are no Government Agencies in any country involved in these rules or regulations. That’s the good news; and you will understand why we are saying this when you read about what’s happening with the USDA Organic Certification above under the heading “What constitutes Organic food and where does it come from?”. As we explained in our first paragraph at the top of this page, we will be encouraging our Aquaponics USA customers to get this “Aquaganic™” Certification. The NOSB (National Organic Standards Board) in the U.S. has already declared that Aquaponic products are not USDA certifiable because they are not grown in soil. The Aquaganic™ Certification is an opportunity for us to step out of all government bureaucracy and make our stand for what we believe in--that Aquaponic fish, vegetables and fruit are the healthiest and most wholesome products grown and sold in the world market today. All we really have to do is sell our Aquaganic™ Certification to the people. As Aquaponic Farms spring up all over the planet with Aquaganic™ Certified products, that sale will be easy with the customer’s first taste of what constitutes real food. Won’t you join us in this worldwide grass roots effort to establish Aquaponics as the most viable, sustainable and healthy way to grow food for planet Earth and demonstrate that Aquaponics agriculture is a SELF REGULATING AGRICULTURE INDUSTRY that has created its own Aquaganic™ Certification process because together we’re better. What constitutes Hydroponic food and where does it come from? Hydroponic food growing technology may sound like a modern, new age way to grow food; but it has been in existence for centuries. The famous Hanging Gardens of Babylon, one of the seven wonders of the ancient world, are largely believed to have functioned according to hydroponic principles. During the 10th and 11th Centuries, the Aztecs developed a system of floating gardens that were based on hydroponics; and Marco Polo indicated in his writings that he witnessed floating gardens in China in the late 13th Century. Hydroponics is a method of growing plants using mineral nutrient solutions, in water, without soil. Plants can be grown by placing their roots in the mineral nutrient solution only or in an inert medium such as perlite, gravel, mineral wool or expanded clay that are flooded with water. As long as the required mineral nutrients are introduced into a plant’s water supply, soil is not needed for the plant to survive and bear edible food. Formal research in an English speaking country did not begin until the 17th Century when Sir Francis Bacon, a British Scientist conducted research on soil-less gardening in the 1620s. His work was published after his death in 1627 and launched a wave of enthusiasm for Hydroponics. In 1699, another English Scientist, John Woodward, experimented with growing spearmint in various water solutions without soil. Across the pond, a UC Berkeley Scientist, William Gericke, promoted the use of Hydroponics in commercial agriculture. 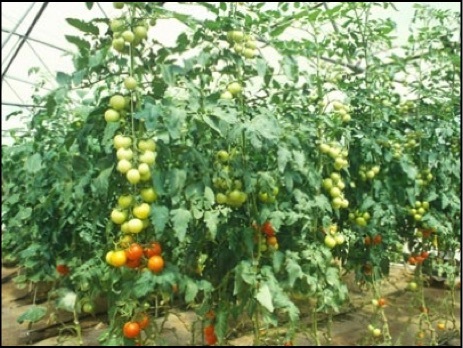 He was able to grow huge tomatoes in his home using just water with nutrient solutions. He called this food growing technique “Aquaculture”; but upon discovering that the name aquaculture was already being used to describe the raising of marine animals, he changed the name to “Hydroponics”. Two other UC Berkeley Scientists, Dennis Hoagland and Daniel Arnon, expanded on Gericke’s work and in 1938 published what is still considered to be one of the most important texts ever written about Hydroponics, “The Water Culture Method for Growing Plants without Soil”. So why are people turning to Hydroponics over soil for growing food? Firstly, Hydroponics allows people the option of growing food in places where soil farming is not an option due to challenging weather conditions. Dry, arid, deserts are the places where Hydroponics got its first firm foot hold. Secondly, it also offers people in urban areas where land is scare and expensive a workable alternative. In island countries where land scarcity is an issue, Hydroponics is again the answer for providing vegetables that would otherwise have to be imported. Thirdly, in countries where the growing season is short, a light and temperature controlled Hydroponic Greenhouse can lengthen it. Another important plus regarding Hydroponics is it uses only about 10% of the water that traditional soil-based agriculture uses because the water is recycled and reused. Where water is scare, Hydroponics is one of the only answers for farmers. 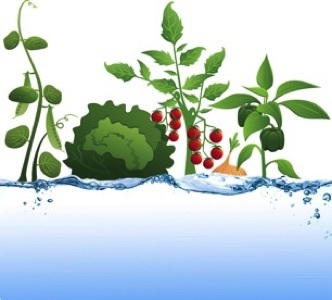 Hydroponically grown plants require little or no pesticides and only around 25% of the nutrients and fertilizers that soil-based plants require. Hydroponic agriculture brings farming home to the local community saving on transportation costs and reduces greenhouse gas use. Hydroponically grown crops have an entirely different root structure than soil-based crops because they do not have to search for nutrients in the soil. The nutrients are delivered directly to them so their root systems do not need to be as deep and extensive before they can put out edible food. 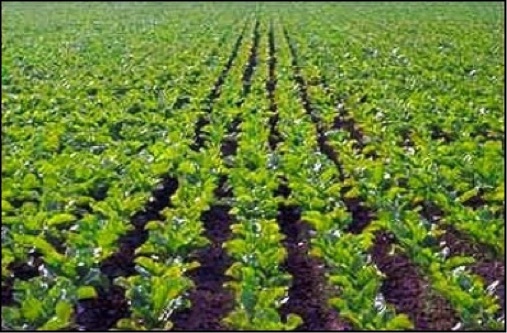 Therefore, these crops can be planted more densely, the harvest time is shortened and plants are bigger and healthier. So exactly what nutrients are beneficial for plants and necessary in a Hydroponics growing system? The three main ones are supplied by water and air alone. They are Carbon (C), Hydrogen (H) and Oxygen (O). Then there are six macronutrients. They are called the macronutrients because plants need them in abundance; and they must be added to a Hydroponics growing environment. They are Nitrogen (N), Phosphorus (P), Potassium (K), Calcium (Ca), Magnesium (Mg) and Sulphur (S). The remaining eleven nutrients are required in small amounts and are, therefore, called micronutrients. They include Boron (B), Chloride (Cl), Copper (Cu), Iron (Fe), Manganese (Mn), Sodium (Na), Zinc (Zn), Molybdenum (Mo) and Nickel (N). There are also what are called beneficial mineral elements, which are needed by only some plants. They are Silicon (S) and Cobalt (Co). For example, legumes need Cobalt for nitrogen fixation and Silicon has been found to improve heat and drought tolerance while increasing resistance to insects and fungal infections. Silicon can also help plants deal with toxic levels of Manganese, Iron, Phosphorus and Aluminum as well as aide in Zinc deficiency. And because plants use some nutrients like Nitrates at a faster rate than other nutrients, this will cause the pH of the solution to increase, which requires the addition of acids like Phosphoric Acid or Nitric Acid. The trick to growing food hydroponically is learning the proper mix of the nutrients; but there are numerous companies in the market place offering pre-mixed solutions and formulas that make this job a lot easier for the hydroponic farmer. One of the trickiest areas of nutrient mixing is knowing which ones will precipitate when mixed together. Precipitation is the turning of a liquid into a solid. For example, if you add Calcium salts with Sulphate salts in concentrated form, they will turn into plaster of Paris. Not an ingredient your Hydroponic growing environment would be able to use unless, of course, you were planning to sell ceramic replicas of your favorite vegetable. Also as plants grow their requirements change and so the nutrient solution must also be changed to keep the plants growing at their optimum. Ammonia has an adverse effect and needs to be kept to a minimum. There are two major kinds of Hydroponics systems, recirculating solution systems and non-recirculating systems. A major difficulty in the recirculating systems is this management of the nutrient balance. Another way of describing this same differentiation is called the batch system or flowing or circulating system. The batch system is commonly referred to as water culture, while the other is named according to the medium used as a sand, gravel, rockwool, vermiculite, peat moss, etc. culture. The recirculating systems require pumps and energy to operate them; and are, therefore dependent on a power source. Below, are two diagrams of the two basic types of Hydroponic growing systems.